A horse has four basic gaits, or ways of moving, including the walk, trot, canter and gallop. At first glance, the trot and canter appear similar since they are both faster than a walk but not as quick as a gallop. When viewed in slow motion, and when felt from atop the horse however, the two are very different. These two gaits can easily be identified by the pattern in which the horse's hooves strike the ground. Faster than a walk, but slower than a run or canter, trotting could be equated to jogging for a human. When a horse trots, his feet move in diagonal pairs. For example, the front left and right rear leg both move forward and back at the same. Since two hooves hit the ground at the same time, the trot is referred to as a two-beat gait. English style riders typically post the trot, which means they lift themselves briefly out of the saddle on each beat. Western riders generally sit the trot, but move their hips with the horse to avoid bouncing against the saddle. Cantering is running for a horse. It's not quite as fast as a gallop, but faster than a trot. In human terms, it could be equated to a racer who is pacing himself rather than running at an all-out sprint. On each stride of a canter, three of the horse's hooves hit the ground at one time, making it a three-beat gait. This differs slightly from a gallop, which is a four-beat gait in which each hoof hits the ground a split-second apart from the others. In English riding the three-beat gait is referred to as a canter, while in Western riding it is typically called loping. In both styles of riding, the rider remains seated while relaxing her hips and body to move with the rocking motion of the horse. Although trotting is a natural gait for a horse, there are different styles of trotting that can be taught. An extended trot, in which the horse extends his stride to cover more ground, is often used in ranch work to cover long distances without tiring the horse or in endurance competitions. A collected trot is a slower pace that expends little of the horse's energy, but keeps him moving faster than a walk. In a collected trot the stride is shortened and the horse does not lift his feet very high. It is often used for show classes and sometimes on long trail rides. There are also special types of trots taught to different breeds of horses for show classes. These often involve raising the legs high and bending the knee for a showy effect. There are four basic styles or types of canter, each with a different purpose. These include the collected, working, medium and extended canter. The difference between these is the speed, which is changed by asking the horse to either lengthen or shorten his stride. The collected canter is typically used for showing and jumping. The working canter is often a horse's most natural speed and is used in hunt seat competition as well as for training and warming up. The medium canter is faster than a working canter, but the stride is shorter than in an extended canter. It is used when a rider wants speed that is still easily controlled, like in show jumping. 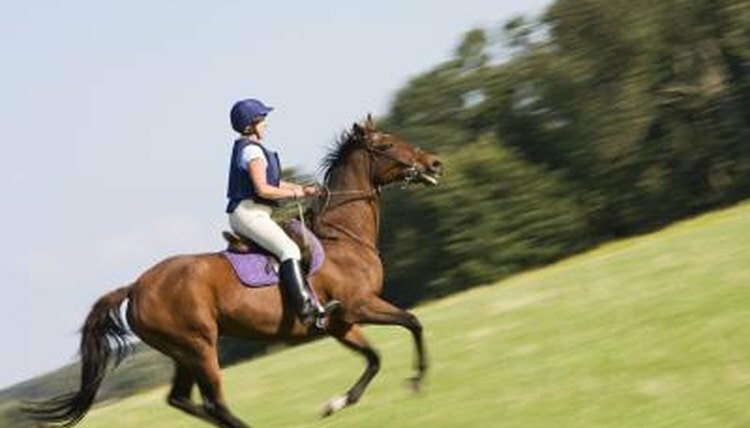 An extended canter is designed to cover a lot of ground in each stride without the horse breaking into a gallop.